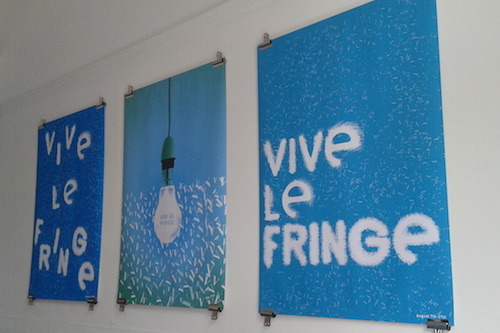 As part of the Edinburgh Festival Fringe, the Institut français d’Écosse has asked the Graphic Design students at Edinburgh Napier University to create posters on the Vive le Fringe! theme. This exhibition is a great opportunity to reiterate a long-lasting collaboration with the Napier University’s BDes (Hons) students. Thanks to their talent and creativity, they offer a high quality exhibition featuring their 9 personal interpretations of Vive le Fringe!. The French poster has a rich historical and artistic tradition. France is considered by some to have been the motherland of the poster, it was there, towards the end of the 19th Century, that a new means of artistic expression was born in the forme of the graphic poster. Despite rapidly changing and converging digital technologies, the poster remains a universal medium that allow graphic designers to react dynamically to reality in its cultural, social and political spheres. The BDes(Hons) Graphic Design programme at Edinburgh Napier University is proud to collaborate with the Institut français again, on an exhibition os posters interpreting Vive le Fringe!, which celebrates the dynamic programme of events and the joyful atmosphere at the Institut during the Edinburgh Festival Fringe. Inspired by the poster cultures and designers of France, in particular, L’Affichiste Michel Bouvet, eight young graphic designers and their tutor harness the graphic power of the poster and together we shout: "Vive le Fringe!". Cameron Knott, Cameron Gibson, Gregor Johnstone, Jenna Brown, Charlie Jennings, Diana Makejeva, Neil Pitman, Sebastian Helene, Myrna Macleod.